Northern Cameroun being where the highest frequencies are found...Y-Hap R1b-V88. Does the full paper indicate whether the researchers have tested the DE-YAP(xE-M96) Y-chromosome from Jamaica for any marker of haplogroup D? If they have not tested for any marker of haplogroup D, then this individual should be considered only as DE(xE) and not as DE*. 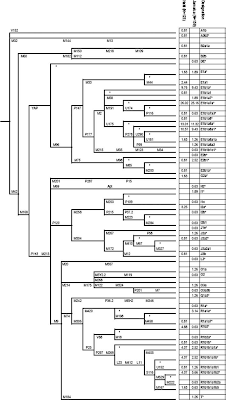 The Jamaican sample includes a characteristically Chinese (or even specifically Southern Chinese) array of O-M175 subclades (2/159 O1a-M119, 1/159 O2-M268, 2/159 O3a-M324(xO3a3b-M7), 1/159 O3a2b-M7), so it is not inconceivable that the researchers might have sampled a Jamaican carrier of haplogroup D of Chinese patrilineal ancestry. They found R-V88 in one Jamaican and no Haitians. That's not significant. The Jamaican population is also showing some Jewish or Near Eastern ancestry. I see Jewish specific J1e, and possibly DE* from a Middle Eastern source - after all DE* was found in a Syrian recently. A few corrections first...'surprised'...'Cameroon'. Typing on a mobile browser. Now, if I read the chart correctly...it says that Y-Hap R1b-V88* is at frequency of 4.88% in Haiti and 0.63% in Jamaica...Y-Hap R1b-M18 is at 0.63% in Jamaica as well, but not detected in Haiti. Also, Ebizur...Chinese, Korean, Japanese, and a few other East Asian groups live throught the Caribbean, Central, and South America. There are over 1 million people of Japanese heritage in Brazil and a sizable population in Peru also. There also South Asians, brought as workers by the Portuguese and Spanish (many of them anyway), in these same regions which could account for the detection of some South Asian haplogroups. It is known that there are some Japanese immigrants in Jamaica...so the DE* could represent their presence or some other East Asian group, like the Koreans...it could also just as likely reprent Nigerian heritage as paragroup DE-YAP* has been found there. They typed for M174. It's unfortunate that we likely will not know whether this individual has African or Asian male ancestry. Any results from Jamaica, no matter how improbable it may appear to some, will not elicit any surprise from me. I lived there for nine years, and I was frequently confronted with some pretty exotic combinations within that population. There are a fair number of Syrians and Lebanese, I believe most arrived fairly recently (late 19th century) and collectively they are known as Syrians. While this group has been fairly exogenous, a significant number practise cousin marriage. The Jews apparently arrived much earlier than the above group, in the late 15th century. Like the Syrians, there has also been a fair amount of exogamy and assimilation. I also wanted to comment on two of the Asian groups, Chinese and Indians but I am out of time. They were known as Lebanese and were almost completely integrated, a comfortable facet of Jamaican culture. They had a very peaceful image and came from an earlier migration than the current global Lebanese communities (which have a very different image). Edward Seaga was even Prime Minister. I cannot believe that all trace of Native American Y haplogroups was wiped out in Haiti. There appears to be no C or P/Q*. Jamaica has a little P/Q* that maybe could be native, maybe? I would love to know if Arawak Y haplogroups survived in Jamaica. The other thing is Jamaica was 65% E and 15% R(xR1a). Haiti 69% E and 20% R(xR1a). This is very different from Afram populations (30% European). 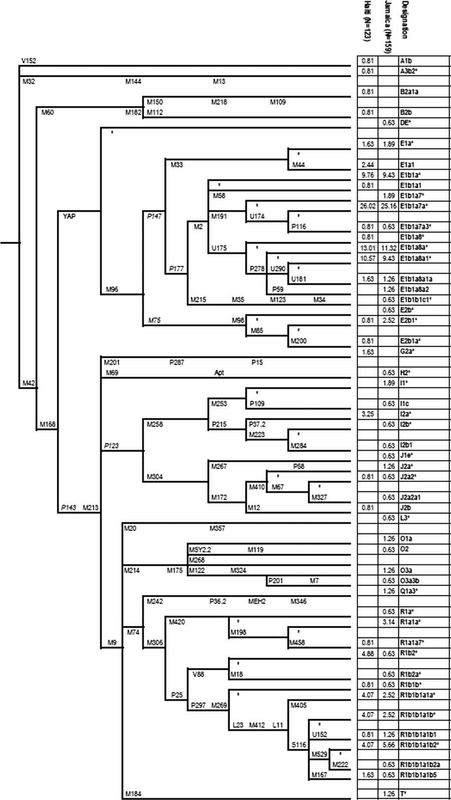 I wish all the authors would realize there are more SNPs out there for all the haploid groups. It would also help to publish the STRs for all the subjects, so that the STRs can be used to indicate the SNPs in those cases where that works. I am an attorney working on a case needing some advise and possibly testimony concerning higher frequency of the Y chromosome in Jamaican males due to to the fact that they are a specific ethnic population, as opposed to Black Americans in general. Please email me at michael_chambers_jr@yahoo.com or call the office at 860-231-9535 if you can spare a few moments to talk. An innocent man's life is on the line.